Is your roofing system currently flat or low pitched? Consider a torch down flat roofing Saint Clair Shores service by Miller’s Home Improvement. 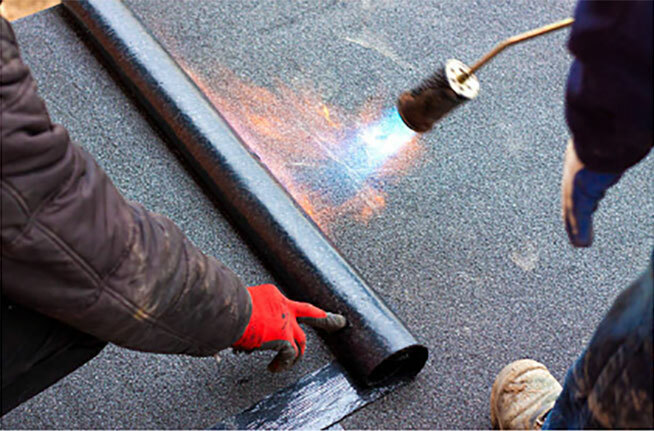 As the term implies, a torch down flat roofing requires that we utilize a blowtorch to weld the material. We unroll the roofing material while we heat the adhesive. This roofing type is popularly known as MODIFIED BITUMEN. Why Would You Want Our Torch Down Flat Roofing Saint Clair Shores Service? Commercial building owners in Michigan choose our torch down flat roofing installation service. Not only is a torch down flat roof a cost-effective material, but it is also an outstanding choice to build a roof garden on. Durable – Modified bitumen is known for its toughness and resistance against weather changes. We can assure you that this material doesn’t crack since it easy expands and contracts. Waterproof – Torch down roofs are impermeable to water. If roofing leaks are the problems you’d rather not deal with, our modified bitumen/torch down flat roofing Saint Clair Shores service is for you. Longevity – This roofing material will last 20 years or more. The lifespan may vary depending on how you maintain it. Our company offers maintenance services. We check whether we can lay the new roof over your existing roof or should do a complete tear-off instead. Hiring us means hiring professionals who are capable of installing your torch down roofing using the highest standards. Our flat roofing and commercial roofing systems are sourced from industry-leading names. Speak with our experts regarding manufacturer warranties. Our St Clair Shores Michigan clients appreciate our personalized attention to their needs. We respond immediately, protect your property, and give you a reasonable price. Want to learn more about our torch down flat roofing service in Saint Clair Shores? Interested in a free quote? Call us now at 248-242-0820.